People have long made fun of Motel 6 and Microtel along with other budget hotels as outdated relics of the past. Business travels lean more toward newly renovated hotels such as Marriott Courtyards and Hilton's Garden and Hampton Inn's. Paul Priestman, a co-founder of British design firm Priestman Goode, headed the team that created Motel 6's new look. He knows how to get the most from small spaces, having prev­iously worked on airplane and cruise-ship projects. The updated design will start appearing in new and existing hotels (of which there are 900) this fall. Priestman built special wall fixtures to illuminate the room indirectly and reduce the need for a lot of overhead lights. "I wanted the light to reflect off the walls, not to blind people." A table and a chair were placed in a corner to create a space for socializing—something that's currently lacking. With a table-side electric socket, and Wi-Fi available for $3 per day, the area doubles as a work space. Beds give the room a sense of openness because guests can see beneath them; the sight line isn't interrupted by a bed frame and skirt. There's also more room to store luggage. Numerous color schemes are in the works: orange (as shown) and possibly green, purple, and tan. Motel 6 is deciding whether single and double rooms (or ground-floor and second-floor rooms) will get different colors. The carpeting is being replaced by floors made of composite wood and plastic laminate. "A lot of people feel that carpets aren't very clean," says Priestman. Priestman believes that furniture in small spaces should serve at least two functions. This unit contains a flat-screen TV and a multimedia panel where an iPod and an Xbox can be plugged in. Behind the unit—and accessible from the side—is a rod for hanging clothes. Students at the Savannah College of Art and Design were invited to enter a contest to create a modern room with a budget of $7,500. Bijal Patel, one of three finalists, was hired to produce the prototype. More than 30 new hotels will use the design this year; Microtel's nearly 300 existing properties will be redecorated as needed. A screen separates the bed from the sitting area. "Guests especially appreciate this feature because it makes the room feel like a suite, with added privacy," Patel says. Rooms will have beds with a new pillow-top mattress, one extra pillow (for a total of three), and a thin comforter between two layers of sheets, instead of a bedspread. Guests noted on checkout comment cards that they'd like more work space, so Patel designed a workstation with enough room for two people (and with electrical outlets built into the desktop). 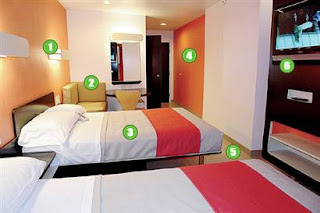 Wi-Fi is free at most Microtel properties. Microtel swapped out box-style TVs for 26- or 32-inch wall-mounted flat-screens after market research showed they were one of the main things people want in hotel rooms. Patel's goal was to avoid the boring beige walls she sees in every hotel. She created six color schemes: cappuccino (as shown), citrus, metro, breeze, nature, and Microtel (a combination of navy blue, yellow, and amber). Properties will each have a single palette. Patel chose granite countertops and a bar and stools (instead of a table and chairs) for what the company calls the MicroKitchen. She aimed to combine the "warmth of the guest's own kitchen with a café-like setting."